Napoleon’s Cause of Death Revised – the Cure Did it! Christopher Browning’s Latest Book: "Euphoria" Did it! "One of the problems is that some practitioners who engage in this kind of therapy, contrary to the evidence, believe in it. They call themselves true believers and think they are doing wonderful things, but in fact what they are doing is very risky and sometimes it’s for the wrong reasons – not therapeutic, but to make a buck." On the downside, such international actions could also be directed against websites and services unwanted by the powers that be. "That is direct evidence that this is Israeli state involvement, whether Mossad or the diplomatic corps." "In order to contain the damage that has been caused, it would be appropriate for the government to hurry and apologize and provide the explanations that the government of New Zealand is demanding." "This is all wonderful news. I applaud the act. The U.S. and Israel have been slaughtering the Palestinians, just slaughtering them for years. Robbing and slaughtering them … Now it’s coming back to the U.S."
Michael Howard’s tale resembles that of Moshe Peer who told a similar story of his six-fold survival of gassings as a child in the non-existing gas chamber of Bergen-Belsen camp (The Gazette, Montreal, August 5, 1993). Howard is either ignorant or a liar – but probably both. "[…] there is little forensic evidence proving homicidal intent. […] The dearth of hard evidence has fueled a growth industry in Holocaust-denial. Revisionists do indeed demonstrate that not millions of Jews died in the area under German control, but hundreds of thousands. Revisionists further demand that material traces of a claimed crime are not tampered with and turned into memorials, but are analyzed with state-of-the-art technologies to determine facts and dispel myths. 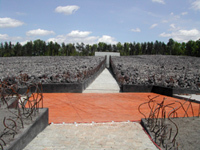 Long forgotten and hidden in eastern Poland, the former Belzec transit camp has now its own memorial, where the death of up to 600,000 Jews is commemorated, who are claimed to have been killed there between 1942 and 1943 – even though forensic research conducted in the late 1990s has shown that these claims are exaggerated probably by the factor of 100,000 (see C. Mattogno, Belzec, T&DP 2004). Because the construction of the memorial allegedly desecrates Jewish remains, the Polish government faces a lawsuit filed by some U.S. Jews. (JTA, June 3, 2004) The construction of yet another holy site of the HoloHoax sure destroyed some forensic evidence and will prevent any further future investigation. Because of Germany’s Hitler paranoia, German lawmakers and scientists do not dare doing reasonable research into genetic health and fertility issues. Futile attempts of coming to terms with a past that will not pass – the shadows of Third Reich eugenics, euthanasia and racial research – was also the issue of an address given at the European Society of Human Reproduction and Embryology conference in Berlin by Professor Rolf Winau. (BBC News Online, June 28, 2004) No wonder German science is falling by the wayside. Japanese commercials advertising the Toshiba movie "Max" about a Jewish art dealer who was a close friend of Hitler during WWI lasted only a few days. Because a Hitler painting was used in it, Jewish protest led to a quick cancellation. (Die Gemeinde, Vienna, March 2004). Canadian authorities refused to renew the license of the Quebec City Radio Station CHOI, among others because the station’s commentator Andre Arthur had remarked that many African students at Laval University are children of dictators. When the radio station brought forth evidence that this was true, they were told that truth is no defense. One of the world’s veteran Revisionists, Ernst Zündel, imprisoned since February 5, 2003, continues to languish in a cell in Toronto’s Detention Centre. Proceedings before judge Pierre Blais have been marked by the judge’s arbitrary decisions. Defense counsel Peter Lindsay’s various motions have been dismissed, he has been excluded from privileged information emerging out of secret meetings, and the judge’s final decision cannot be appealed. Defense counsel’s move to contest this in Canada’s Supreme Court may be set down after Judge Blais has made his decision on the matter thus making the Supreme Court action irrelevant. The last haring date set so far is on Sept. 15, which would enable the judge to send Ernst Zündel to Germany the next day. On April 8, 2004, the German County Court Berlin-Tiergarten banned German lawyer Horst Mahler from practicing law. Mahler is currently on trial in Germany for his revisionist views. Because he continued to make revisionist remarks during his pleadings (incitement to hatred under German law) and due to his ongoing accusations against the German governmental system (denigration of the German constitution), the court decided that he is unfit to serve as a lawyer. (ref. 351 Gs 745/04) In the meantime, two con-spirators of Mahler (Ursula Haverbeck and E.O. Cohrs) have been sentenced to a fine of some $4,000 by the county court Bad Oeynhausen. German police raided 333 homes in Germany in search of music CDs containing outlawed right-wing music. A total of 342 persons are being prosecuted for this. (Stuttgarter Zeitung, March 25, 2004) A few months later, schools in the Germany were flooded with some 250,000 free CDs containing right-wing music with titles like "project schoolyard," "adaptation is cowardice," or "songs from the underground." The German government now floods German schools with leaflets to counter this music campaign. Whereas German authorities claim they can do nothing to prevent a left-wing grass root initiative to collect and publish personal details of right-wingers (Die Welt, Feb. 3, 2004), a similar initiative by a right-wing organization to collect personal details of left-wingers was swiftly declared illegal, the right-wing organization banned (Neues Deutschland, Jan. 26, 2004). Since the German army depends on loyal soldiers, the German Federal Civil Court decided that it can exclude soldiers from service who are members of a patriotic party, in that case of the modestly right-wing Republikaner (loyal, Sept. 2003). Thus, if German soldiers are not allowed to be patriots, they all have to be traitors! It does not serve the truth if the truth is put down in law books instead of in the heads of the citizens. Truth is not served if it must be believed, not because it is irrefutable, but because it is ordered. […] if governments take charge of writing history, leaving historiography not up to society but stipulating it by penal laws, then this does not tell us anything about this historical truth, but everything about such governments […]." "The government intervenes a second time in the same matter: first to build Auschwitz and to let it operate, and a second time to punish everyone who claims that it did not exist." "[…] the mathematical equations used by paleo- and neo-Nazis to ‘down-calculate’ the number of victims may be repulsive […]"
The German penal law, however, outlaws the use of torture (§343). Prof. Wolffsohn is Jewish. Washington has refused to deal with a lawsuit the Herero tribe in Namibia intended to file against Germany. They want to get 2 billion dollars in reparation for the quenching of the Herero uprising against their German colonial masters in 1904. Now the Hereros look for diplomatic support to enable them to sue Germany (Spiegel, Feb. 9, 2004). Source: The Revisionist 2(3) (2004), pp. 357-360.